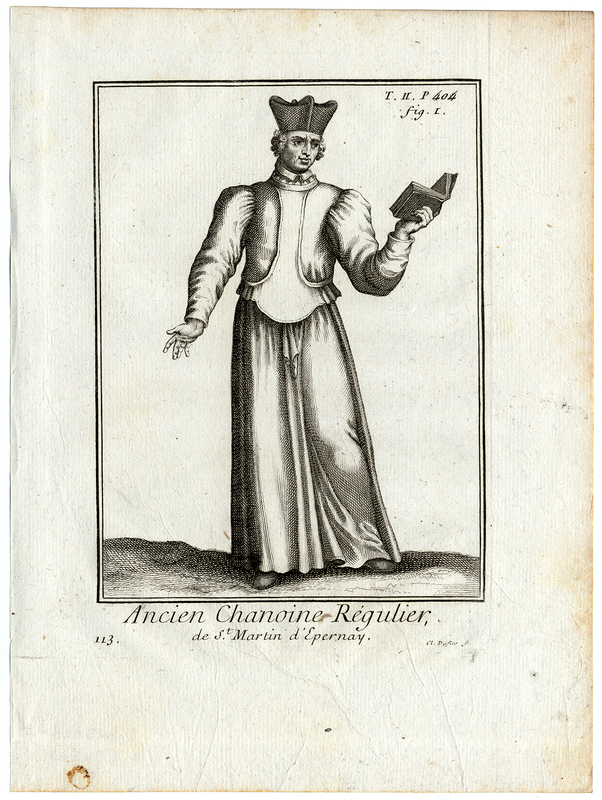 Subject: Plate 113 : 'Ancien Chanoine Regulier de St. Martin d'Epernay.' (Ancient Canon Regular of Saint Martin of Epernay, France). Condition: Very good, given age. A stain in the bottom margin, margin edges a little stained. Faint printer's creases in the bottom half of the sheet (slightly affecting image). General age-related toning and/or occasional minor defects from handling. Please study scan carefully. Size (in cm): The overall size is ca. 18 x 25 cm. The image size is ca. 12.5 x 18 cm. Size (in inch): The overall size is ca. 7.1 x 9.8 inch. The image size is ca. 4.9 x 7.1 inch. Description: This print originates from a book: 'Histoire des Ordres Religieux et Militaires (...).' (History of Religious and Military Orders. ), by R.P. Helyot, published in Paris, 1792 ed. First published 1714-1719. Helyot made lengthy journeys throughout Europe, which afforded him ample opportunity to collect material for his great work on the religious orders. It treats the history of religious and knightly orders, and of congregations of both sexes, down to his own time, and exhibits more particularly their origin, growth, deterioration, suppression, or dissolution, various offshoots and reforms; adding also the lives of the chief founders, and illustrations of different monastic habits. Being written on scientific principles, though not always with critical insight, it was very favourably received, and achieved a wide circulation (Catholic Ency.). Vols 1-5 by Helyot and vols 6-8 generally attributed to Maximilien Bullot. Artists and Engravers: The author of this work is Pierre Helyot / Father Hyppolyte Helyot (1660-1716). Engravers include P. Giffart, Thomassin, De Poilly, and T. Duflos.